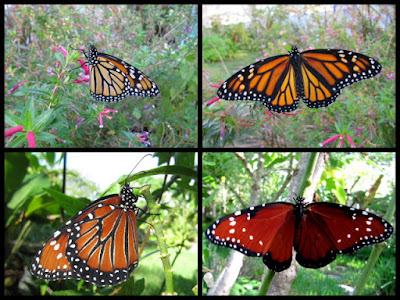 Everyone knows and loves the Monarch butterflies, and when meeting their needs with planting milkweed and nectar plants they aren't a rare sight in the garden. 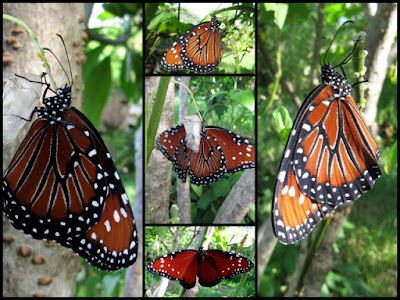 But the Queen (and the Viceroy) are not so often seen, so when they visit Myrtle Glen, it sure is a royal event! A few weeks ago I noticed two Queen caterpillars on the yellow milkweed. 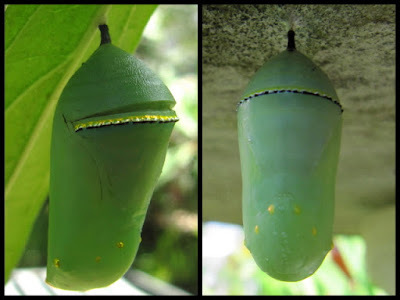 Queen's caterpillars are similar to Monarch caterpillars but they have three pairs of filaments, these feeler-like extensions are sensitive to touch and sonic vibrations. 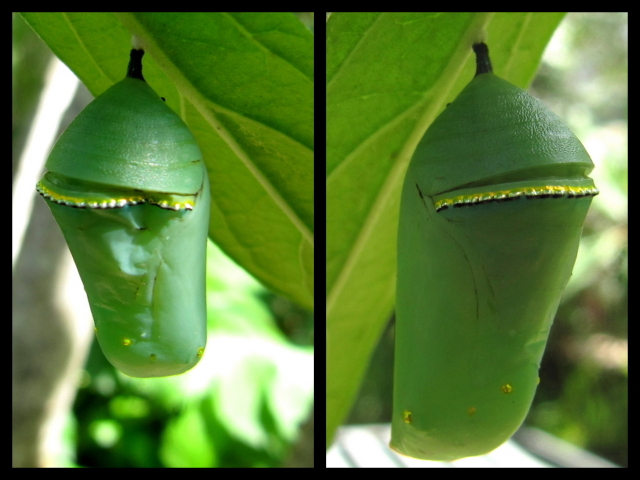 I kept a close eye on my precious caterpillars, sadly the small one was gone one morning but by that afternoon the large caterpillar had changed into a beautiful, emerald-green chrysalis with golden accents sparkling in the sun... . And to my horror it had a DENT! The Monarch and Queen look very similar, the picture below shows the Monarch top row and the Queen bottom row. And if I hadn't seen the caterpillar I would have mistaken the chrysalis for a Monarch chrysalis. 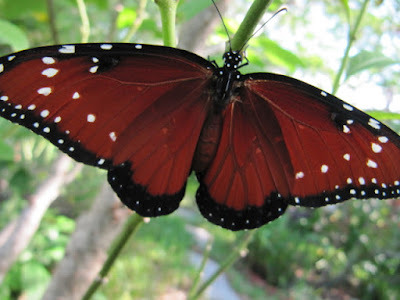 Viceroy butterflies do not use milkweed as their host plants, they lay their eggs on shrubs and trees in the willow family. I don't have any Willows in my garden, but this royal visitor stops by occasionally to sip nectar from the many flowers planted for butterflies. 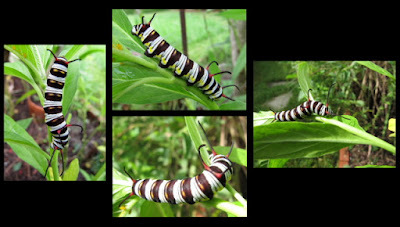 So exciting to see a Queen caterpillar! I've never seen one before. I'm glad one managed to escape the bird! It is interesting to see the difference between the monarch and the mimicking butterflies.